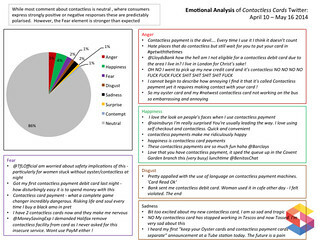 Social media sentiment provides a useful perspective on the evolution of contactless payments in the UK. If you are interested in the perception of contactless cards in the UK you might find my podcast with Karen Williams from SpectrumInsight interesting. Just out of curiosity we’d asked SpectrumInsight if they could apply their social media analysis techniques to anything as boring as payments and Karen had risen to our challenge by agreeing to monitor the space for a month or so. We chose contactless payments as the specific sub-topic to monitor. Karen was kind enough to pull together what they found into a few slides for us to share on the blog and I’ve picked out four of them to highlight here. 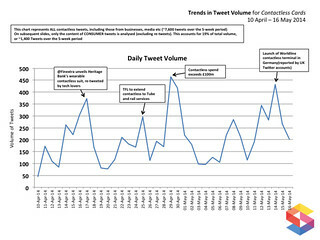 That first chart seems to indicate, as you might expect, some correlation between topics being discussed in the mainstream media and the topics discussed on Twitter so this provides some confirmation that the discussions on Twitter are vaguely anchored in reality. 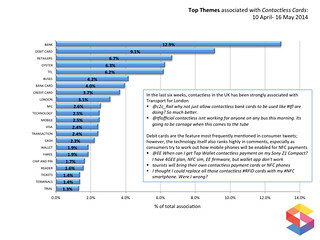 The second chart concerns the top themes that were covered in tweets about contactless. Unsurprisingly, “bank” and “debit” are at the top. But if you put together Oyster, buses and TfL, then actually transport would come top. I realise that this is a London-centric perspective, but I take these issues to be a reflection of the importance of mass transit in pulling contactless into the mass market. 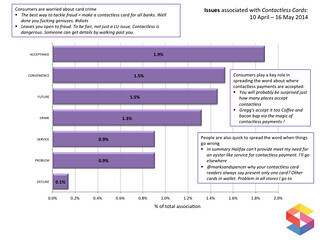 The third chart concerns the issues that we covered in tweets about contactless. The main one, as you can see, is acceptance and (good news, I think) this reflects a general sentiment that people want contactless to be accepted in more places. I’m convinced that one of the reasons why cash is still more than half of all retail transactions in the UK (compared to 40% in the US where the near-ubiquitous no-signature-swipe provides the functional equivalent of contactless) is that small merchants in particular are not well served. I still see signs saying that cards are not accepted for transactions below (say) £10 when the merchants should really be demanding contactless-only transactions for small amounts (see Julian Niblett’s comments on this last year). And that last slide looks at emotions, not something I normally consider when looking at the contactless adoption curve and therefore of great interest. See what you think, but I think we as an industry should probably be reacting to the “fear” area with some pretty clear messaging around how the technology works, how liabilities are distributed and the consumer protection that the combination provides. From looking at these slides and talking to Karen, I think I draw three broad conclusions that I hope will be useful input to our clients strategies around the technology. First, I’m surprised that so many people were complaining that they wanted contactless cards but couldn’t have one (my son is one of them, by the way). Secondly, while it might hard to get people to try contactless it seems that once they try it then they like it and they want to be able to use it in more places. So we probably need to have short term focus on the getting them to use it that one time to get started. Maybe more focus on vending machines? Third, if the Twitter sentiment is anything approaching a reflection of what normal people actually think, I don’t understand the issuers’ baffling strategy of sending contactless cards to people who don’t want them and not sending them to people who do want them. Dave – the % of cash in transactions under $20 is way over 90. I am curious why would merchants demand “contactless” instead of cash in LVP and micro payments when this would cost them as much as 10% of the transaction amount? This is probably more than the margin they earn on say $2 or $3 purchase. For as long as the current IX business model is used in these circumstances there will be no progress. Eventually funds needed for transaction funding will not be “acquired” from the issuing banks on the other side of the “interchange networks”, but will come directly from various SVAs and connected current accounts, and the consumer risk will be taken out of the payment equation and moved to the credit issuers’ business model. We will see then that the marginal cost of payment transaction processing is near zero and so will be the cost to the merchant (regardless of the transaction size). There will also going to be a shift towards compensation derived from facilitation of higher sales for the merchants and essentially giving away the payment for free (see LevelUp and Dwolla). Contactless cards (or contactless mobile payments) are but an attempt by the payment established to extend the life of the 4-party business framework that outlived its usefulness. Would you propose such framework if you were starting a universal payment cloud from scratch today with all the networks and consumer electronics ubiquity?